These would be quick to make, if you are used to sewing, and needed a last minute gift. I wanted to make something for some of the girls in the family who are into fashion. 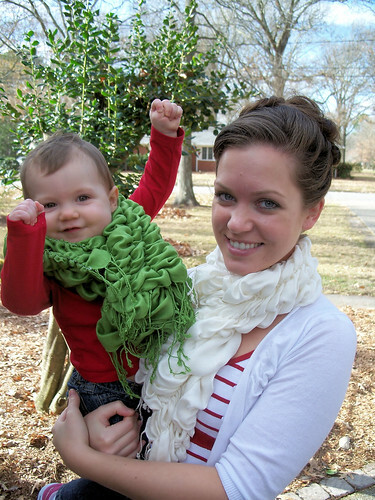 I took these normal scarves that you can find at Walmart for $5 each and made them all ruffly. Here is a quick how to. 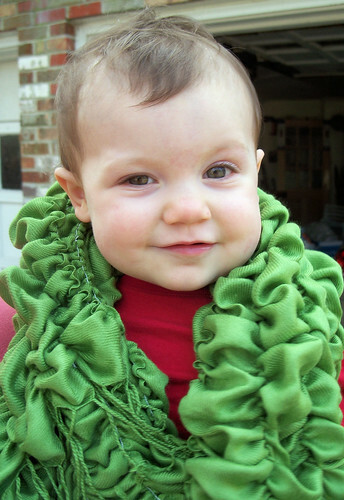 You will need a scarf, matching thread, elastic thread, and a sewing machine. 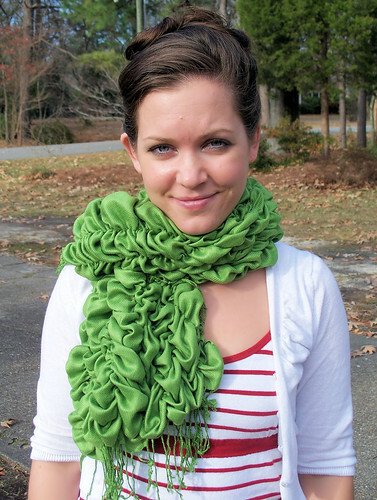 You need to figure out how far apart you want to sew the lines on the scarf to make it ruffle. Since the ones I used had fringe, I just went by those. I made a straight line down the scarf every six threads and on the very edges, I made lines after the first two fringes. To sew the lines, use the coordinating thread in the top of the machine and use the elastic thread in the bobbin. Sew the straight lines and after each line, sew the elastic and thread together at the starting point and then at the ending point. Make sure that you use a smaller stitch when sewing on thin fabrics. And be sure to always sew with the same side facing up (you can see the elastic, so it looks best if it’s all on one side). So elegant, so clever, I love the handbags you made as well, when do you have time for all the creativity? I love checking in to see what you’ve been making, thanks for the inspirations! Merry Christmas, to your little family! look how cheeky jaala is in that pic! so cute! Very cute! 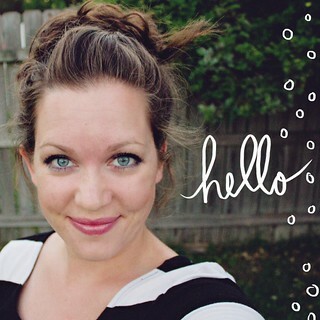 I am enjoying your blog and your great ideas! Thanks for posting! I love your work, especially those scarfs 🙂 I’m gonna do one on my own today, wish me luck! 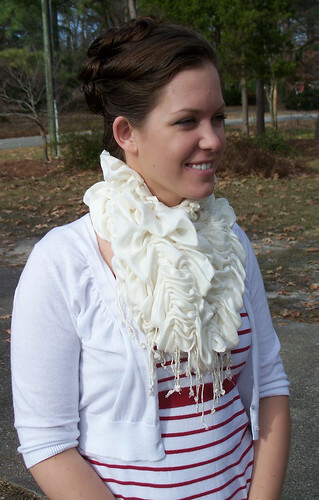 I always see nice but boring scarfs at our local thrift stores, now I know exactly how to make them AWESOME! Thank you so much!!! very cute yes indeed but what about that hair how cute is that!!!! Lets see something on how to do your hair do! These are soo cute I want to go to walmart today and make one. I am very much a beginner when it comes to sewing and thought this was such a very cute and creative project for me to try. 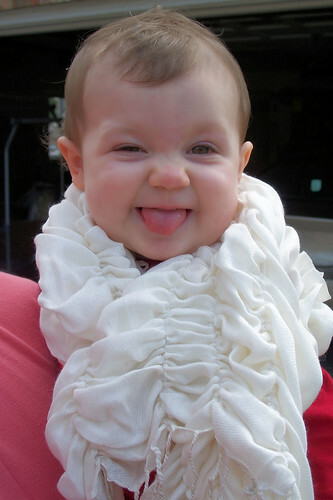 How did you get the scarf to scrunch up, did you do something special? What a great idea. Do happen to have a “before” pic? I was wondering if the scarf was rectangled or square? I do not have a before picture, but it is a rather large rectangular scarf. They are still very popular and I see them in all kinds of stores. You are amazing. I love your “anthropologi-fied” items. Thanks for the tutorials!